Message from George Downs, the Member UK Youth Parliament about the impressively organised young people-led campaign in Devon. 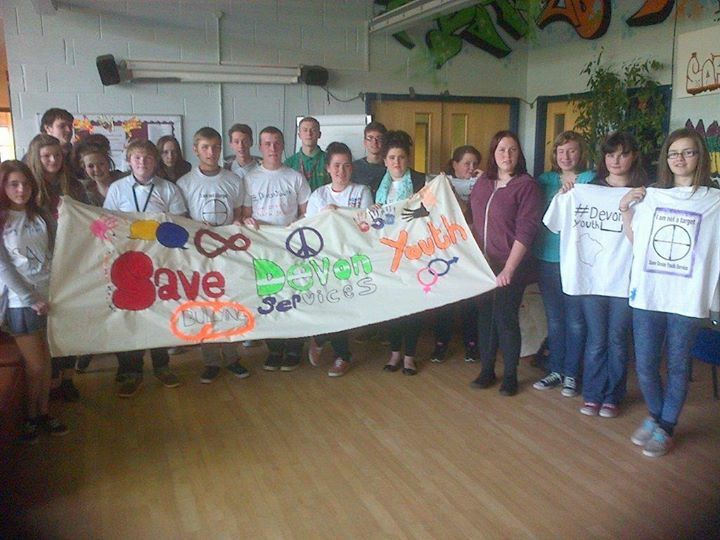 On Saturday 29th March over 20 young activists from across Devon met in Exeter as representatives of their local Save Devon Youth Service campaign groups. The aim of the meeting was to network with isolated young activists in order to gain an insight into the dedicated campaign work young people have been participating in since the cuts were announced. Hosted by George Downs MYP and Alfie Weaver, we participated in workshops throughout the day including how we can learn from each other and common goals for the future. Every young activist was encouraged to organise a campaign day in their local village/town/city centres and turn up with as many of their fellow youth service users as possible to the final young person’s consultation event in Exeter on Friday 25th April. The day included banner and t-shirt making and we all agreed that the consultation so far had not just been useless but insulting to all stakeholders, young or old. In particular the young people from Teignbridge highlighted to everyone else the inappropriate, confrontational and in some cases disgusting behaviour of county council representatives at the Newton Abbot young people’s consultation event on Thursday 20th March. We are facilitating young people to write formal complaints and demand an apology.At present we are empowering young people to have a say in the current youth service review. We are highly concerned of the county council’s proposals not only as a financial burden on other services in the future but also the high level of human misery which we are sure that these changes will cause. Considering the conversations which we have had with those within the voluntary and community sectors, there is an overwhelming consensus that they do not have the resources and in many cases experience to be able to provide a preventative, educating, specialist, core, open-access youth service. Furthermore we are deeply worried that the majority of decision makers and senior managers have absolutely no idea of what the aim of open-access youth work is. There are obvious examples of vast detachment, naivety and in some cases ignorance of what our youth service provides on a weekly basis. Even though the council are proposing a more targeted service, young people who attend the special educational needs sessions led by individual council-run youth centres will be stripped of one of their only opportunities to try to live as much as a normal life as possible. Despite retaining the youth parliament, local youth voice mechanisms such as the council-run youth panels will be dissolved and without a facilitating youth worker. This will greatly disable the role of UK Youth Parliament Devon to improve the communities of not just young people but all citizens on a local level. Although the proposal aims to support the youth voluntary sector, the Local Youth Network funding allocated to such organisations will be reduced and young people (who are nominated youth representatives from voluntary youth groups) will not have a say in how this money is spent. Therefore it is evident that by abolishing a publicly provided open-access provision, targeted youth work, youth voice and the third sector will all be severely damaged as a result. As a preventative provision, Devon Youth Service’s success cannot be measured unless we consider the social problems which it prevents. Devon and Cornwall Police agree with us on the fact that the proposed changes to the youth service will rip a hole in the fabric of our county’s society. We are actively working with Police and Community Support Officers in some of the most deprived areas in Devon. They reiterate that council-run youth centres greatly help the commendable work our emergency services. Next Choose Youth questions Labour’s silence re Youth Work. Meanwhile in Scotland……..